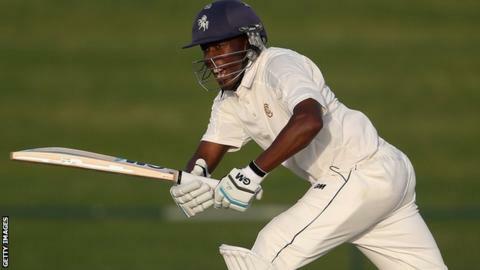 Daniel Bell-Drummond's fine knock of 123 rescued Kent's innings after a slow start against Glamorgan on the opening day at Canterbury. He stood firm as the Welsh county worked their way through the top order, hitting 17 fours before he was bowled by Australian paceman Michael Hogan. Thereafter, Darren Stevens made exactly 50 as Kent moved towards 300. But Hogan ended the day with 4-53, his best performance of the season so far, as Kent closed on 330-8. Home skipper Rob Key opted to leave himself out of the Kent team for the game because of his poor form. Sam Northeast was pressed into service as captain but he only made eight before falling lbw to Craig Meschede, and Kent were indebted to Bell-Drummond, whose innings was only 30 short of his career-best 153. "I probably bowled a bit more than I should have given my prior injury and I'd spoken to the doctor about restrictions. "I suppose when you're out there you just want to do well for the team and it's good to get some work in. "I said last week I got some wickets but I didn't feel I bowled too well, but today I was in and around my best stuff."